Whatever happened to the children of Marie Antoinette? King Louis XV escorted the newlyweds Marie Antoinette and Louis-Auguste to their bridal chamber on their wedding night in May 1770, gave them his blessings and a goodnight kiss. Clearly nothing happened that night (the sheets were inspected extensively by the courtiers the next morning). Bear in mind the bride was 14 years old at the time and the groom was 15! It could have been their inexperience that night, but nothing happened for the next 7 years to come. 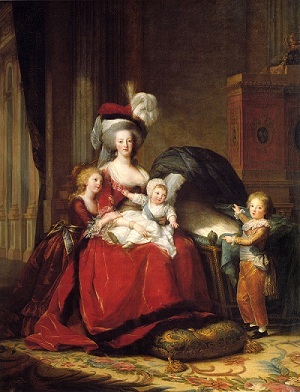 It took eight years before Marie Antoinette and Louis XVI had their first child. Given that the queen's main task was to bring forth an heir and successor this was a frustratingly long time for everyone involved. Only after a visit of Marie Antoinette's brother, Emperor Joseph II, the problem, whatever it was, got solved. It was either that the emperor had to give them some kind of 'education', or he convinced Louis to have surgery to correct his problem. Unfortunately, the first child was a daughter, Marie Thérèse (20 December 1778 - 19 October 1851). Marie Antoinette was happy with a daughter; a son would have belonged to the nation, a daughter she could keep to herself. 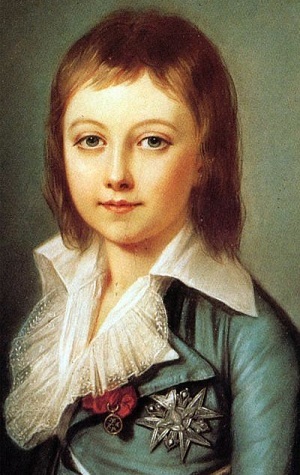 3 Years later, the long awaited son, the dauphin of France was born, Louis Joseph (22 October 1781 - 4 June 1789). 2 More children came after that; Louis Charles (27 March 1785 - 8 June 1795) and Sophie Beatrix (9 July 1786 - 19 June 1787). 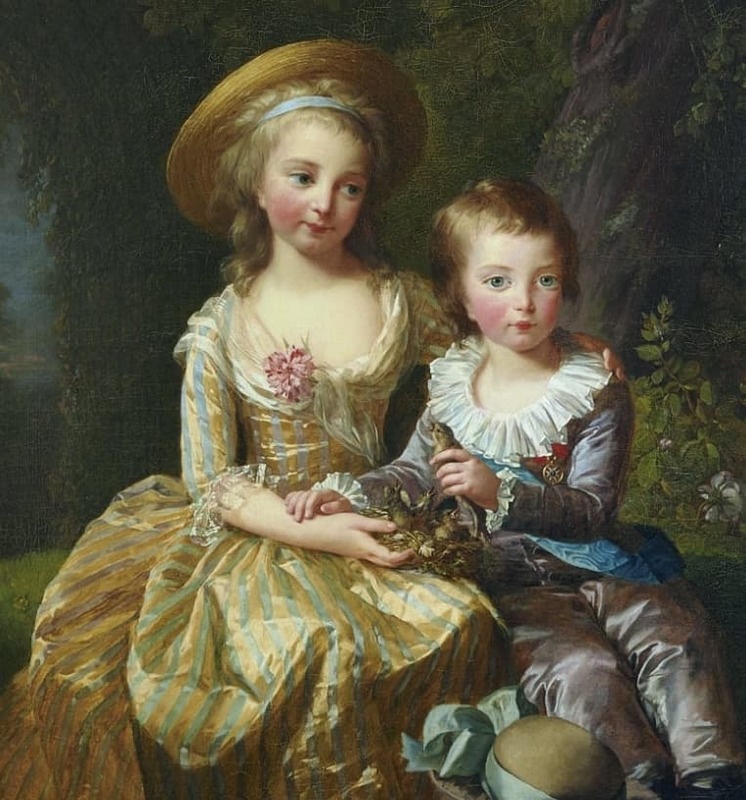 The Children of Marie Antoinette and Louis XVI had no happy childhood. Only the eldest daughter would reach adulthood. Like many children in this period of time 2 of the children of Marie Antoinette died prematurely, Sophie Beatrix was not even a year old, and the Dauphin, Louis Joseph died at the age of 7 from tuberculosis. After his death, Louis Charles became the new dauphin of France. The story of this new heir to the France throne is horrible. During the French Revolution the royal family taken from Versailles and forced to live in the Tuileries, where they were guarded 24 hours a day. When the situation became hopeless in June 1791, the royal family tried to flee the country. Dressed up as a valet and a governess to a Russian aristocrat, the king and queen tried to get out of France. They were recognized when they reached Varennes, almost at the border between France and Belgium. This territory was part of the Austrian Netherlands, under Habsburg rule at the time. 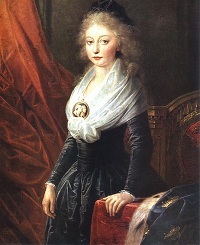 Marie Antoinette, being a Habsburger, hoped to find support and safety there. After their shamefull capture and return to Paris they were not allowed to go back to the Tuileries Palace. Instead, they were imprisoned in the tower of the Temple, an ancient fortressin Paris, built by the Templars in the 13th century. For this family, used to the luxury and opulence of Versailles palace, this was a horrible place. But it would become much worse. 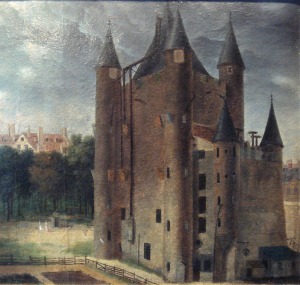 The first period in the tower, the family lived together, the king, the queen, their two children and the sister of the king, Princess Elisabeth. Than, on 21 January 1793, Louis XVI was put to death under the guillotine. The monarchy was abolished in 1791, but the new rulers did not know what to do with the still living Louis Charles. Monarchists already claimed he was King Louis XVII. On July 3, 1793, only 8 years old, he was separated from his mother, sister and aunt and individually locked in the room where his father had been before his dead. The medieval fortress Temple in Paris were the Bourbon family was imprisoned during the French Revolution. Louis Charles, dauphin of France according to the royalists, was kept in absolute isolation, completely neglected. He had virtually no contact with other people and was not informed of the execution of his mother (16 October 1793) and his aunt Madame Élisabeth (10 May 1794). He was dirty and sick, his room was not cleaned nor could he wash himself or his clothes. He was beaten and humiliated, all to try to punish him for his royal descent. Most likely he was insane at the end of his life caused by this treatment. Eyewitnesses claim he did not speak anymore and could barely move. He was covered in pests and faeces. Louis Charles died on June 8, 1795 at the age of 10, having spend nearly four years in solitary confinement. Until very recently, there have been rumours and speculation that the child which died in the tower was not the real Dauphin. He'd been freed by royalists and another child would have been placed in the tower. This would be the real reason why he was separated from his family and no contact was allowed with him. Fuelled by these stories many men claimed that they were the real Louis Charles and thus the first in line to the throne of France. These stories started in the years after the French Revolution and there are still people today who say they are the descendants of Louis XVII. The recent developments in science, particularly the knowledge of DNA, made it possible to reveal the truth in 2000. After 200 years the mystery was finally solved. There is a great book about the history of Louis Charles and the huge aftermath after his death written by Deborah Cadbury, the lost king of France. It is a fascinating and very sad story. It is not possible to visit the Temple tower where the family was imprisoned. The building became a place of pilgrimage for followers of the Bourbon family. Therefore it was demolished in 1808 by order of Napoleon. However, when you get off the subway at station “Temple” you are at the right location! When you visit Paris you can take a tour that takes you back to days of the French revolution. With a passionate guide you will visit all the important historic sites. All this time, Marie Thérèse, or Madame Royale as she was called in the Versailles time, had been locked up in the tower above her little brother. She could not contact him. She is the only one of the children of marie antoinette that would survive the French revolution. From from August 1792 until December 1795, Marie Thérèse was locked up in the tower, forced to watch her family members been taken away one by one. She did not know what had happened to her mother, aunt and brother until much later. She could hear her brother's cries though, when he was being beaten in another room of the castle. She only had two books that she read over and over again. In December 1795, on her seventeenth birthday, she was finally reliesed, traded for some French prisoners with the Habsburg Emperor Francis II, her uncle. Marie Thérèse is all alone. Her parents and siblings are all dead, as are most of the people she knew from her youth are dead or in exile. She herself will also spend most of the rest of her life in exile in foreign lands. When she is liberated she goes to Vienna, later to Mitau, Courland (now Jelgava, Latvia) where her closest family members live in exile. In order to help restore the Bourbon Dynasty she marries her cousin Louis-Antoine, duc d'Angoulême. He was the son of her father's younger brother. In the meantime, her father's eldest surviving brother proclaimed himself King of France as Louis XVIII. Since he had no children of his own, he arranged the marriage between Marie Thérèse and Louis-Antoine. He hoped they would have childred to finally succeed him and prolonge the Bourbon rule. However, the couple never had any children, in fact, the question has been riased if the marriage was consummated at all. The plan of King Louis XVIII worked just for part; his younger brother succeeded him as King Charles X and Louis-Antoine and Marie Thérèse became Dauphin and Dauphine of France. In 1830 King Charles X was forced to abdicate. This resulted in his son becoming King Louis XIX and Marie Thérèse becoming Queen of France. This lasted for only 20 minutes thought, the time that Louis-Antoine needed to sign his own abdication papers. The singing of the papers was done in the Château de Rambouillet. Marie Thérèse had to leave France in exile again, this time to Great Britain, later to Italy an Austria. She spends the last years of ther life in Schloss Frohsdorf, near Vienna. 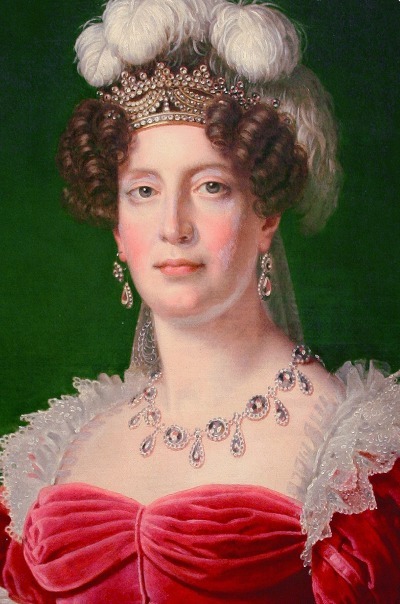 Her husband died in 1844, Marie Thérèse died in 1851. They are buried in the crypt of the Kostanjevica Monastery in what is now Slovenia (than part of the Austrian Empire). From 1807 until 1837, a mysterious couple lived in a castle near Hildburghausen in Germany. The woman was rarely seen, and if she did appear she was veiled. Rumours rose that this women was the traumatized Marie Thérèse, who had swapped places with another lady during the French revolution. This mystery was also proofed wrong after a DNA test on the remains of the women in 2014. It was definitely not Marie Thérèse, but the real identy of the women remains unknown.